THE CITY WITHOUT PUBLIC FUNDS & OPPORTUNITIES FROM THE CRISIS | Consultores en urbanismo. CONSULTORÍA JURÍDICA Y TÉCNICA, URBANISMO Y MEDIO AMBIENTE. 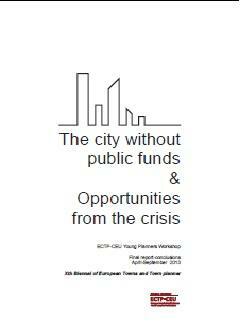 The present publication contains the findings of the workshop developed between May and September 2013 under the coordination of ECTPCEU on the topic “City without public funds”. The results were presented in Cascais (Portugal) on September 20th-21th 2013 in the framework of the Xth Biennial of European Towns and Towns Planners.